With the official start of winter just days away, it is a good time to get your home and automobile ready. While some types of home heating equipment require little preparation, it is best to review yours before the snowfall. Winter home heating carries the risk for fires and carbon monoxide poisoning, which can result from a build-up of the invisible, poisoning gas. Each year, half of all home fires occur in the three months from December to February, when home heating equipment is most used. Some 1,500 Americans die each year from carbon monoxide poisoning, while more than 10,000 suffer carbon monoxide injuries, according to Children’s Hospital Boston. Make sure your smoke detectors and carbon monoxide alarms are working and properly placed. Massachusetts requires smoke alarms be installed on every habitable level of a residence as well as in basements. Carbon monoxide detectors are also required on every habitable level of the home. Additional units are recommended outside of bedrooms and sleeping areas. Get your chimney professionally cleaned once a year. Report any cracks or water leaking. Fall is the best time for a cleaning. Creosote can build up in the chimney over time, lead to blockages and produce carbon monoxide. Creosote is created when firewood does not burn correctly, when wet or soft wood is placed in the fireplace and by closing the fireplace before the wood is fully burned. Open the fireplace damper before lighting and keep it open until the ashes are cool. Never close the damper before going to bed if the ashes are still warm. An open damper may prevent the build-up of poisoning gases. Light your fire with matches. Never use gasoline, charcoal lighter or another fuel because the vapors can explode. Make sure you have no flammable materials near open flames. Your heating system will likely have a vent on your home’s exterior. The vent will have two pipes, one of which lets air in and one of which sends air back out. Make sure both of these pipes are kept clear of snow to avoid carbon monoxide from building up in your home. Check your snow tires and decide whether you need new ones. Check your tires’ air pressure using a gauge, which you can purchase at an auto parts store. Put an emergency kit inside your car and make sure it includes a neon-glow vest, snacks, a flash light and other essential supplies. Click for a full list of emergency safety supplies. If you have a garage, make sure you do not warm up your car inside it with a closed door. Pull your car out and heat it in the driveway to prevent carbon monoxide poisoning. 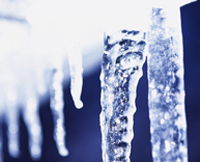 Extreme Cold: A Prevention Guide to Promote Your Personal Health and Safety, Centers for Disease Control. Home Safety Tips for a Safe and Healthy Winter, Home Safety Council. Winter Safety Tips, The American Red Cross.